Professional staging can be pricey. If you're looking to sell, check out these expert DIY tips, and get ready to move. When you're putting your house on the market there are approximately one million things on your mind. Here's one thing you definitely don't want to overlook, because it can mean more money in your pocket: the house has to be ready for prime time. When potential buyers walk in the door they bring a critical eye. All the little things you've grown accustomed to and don't even see anymore will stand out to them like a flashing red stop light. So before you open the door on your first showing or open house, it's time to get your house in order. Realtor and interior designer Magen Ferrell develops a to-do list for her clients, and shared some of her best tips with NBC News BETTER. The good news? Some of it's as small as changing a lightbulb. Ferrell starts with the same advice for all her clients: Deep clean the house. Specifically, be sure to include the windows and tile showers (especially any moldy grout). And grab your Magic Eraser “and go through the whole house, but especially the kitchen,” she said. With white cabinets having such a moment, “people get numb to them and how they're not as white anymore.” But you can be sure buyers will notice greasy fingerprints. Once you have a clean baseline, think about planters, fresh flowers, just something attractive, Ferrell said. “I'm big on wreaths.” Also, get a nice doormat. People like to close their curtains to watch TV, Ferrell said, and the tendency is to forget and leave them like that. But open curtains and blinds, she said. “More light makes it feel bigger and brighter and very clean. Natural light just has a positive effect on the ambiance [when you're] showing a home.” Of course it's important that the windows are clean as well, she added. “I'm really big on fresh paint,” Ferrell said, but that has to include trim. “A lot of times people paint the walls and not the trim and honestly it's like wearing dirty white jeans. It makes it feel dirty.” Either paint the trim, she said, or at least touch up any scuff marks, and run a fresh caulk line, which “makes everything so crisp.” If all else fails get out the Magic Eraser and go to town. A bulb that's out may not seem like a big deal, but “anytime a buyer sees something the seller is not taking care of, the worry is 'what else?' [There's a] domino effect in their brain,” she said. 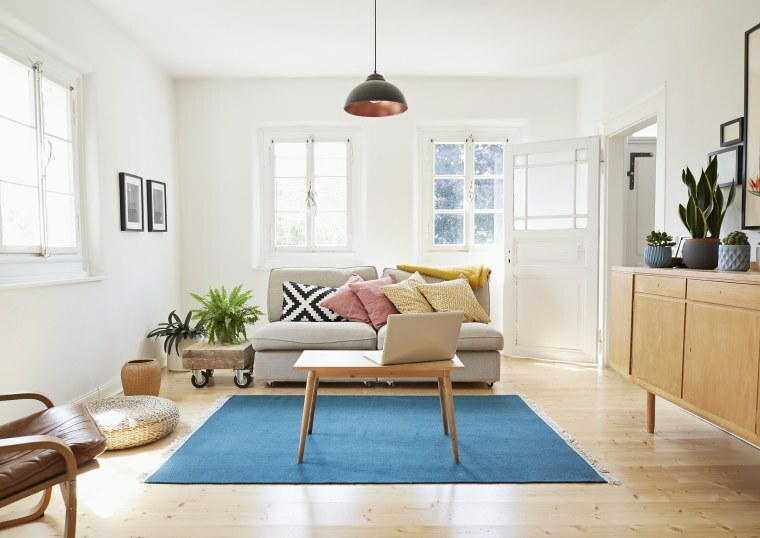 “It's so simple, a one dollar light bulb and suddenly it just feels like the home is move-in ready and has been maintained.” Take it a step further, she said, and make sure all the exposed bulbs match. It's better to have a house furnished than empty for showing, Ferrell said, provided the furniture isn't dated. However, now's the time to do a little streamlining. Move out any oversized furniture, or extra pieces that could make a space feel crowded, she said. Also, clear out toys and closet clutter — nobody wants to see overflowing closets. And now's the time to remove all personal photos and anything that makes it seem like your house, and not their house, she said. In place of that gallery wall of kids' school photos, replace it with a work of art — any art, she said. Once you have more of a clean slate, Ferrell said, build on it with plants and a nice centerpiece for the dining table. Enlist a friend who can be honest to tell you what they smell when they walk in. If it's dog, cat litter, cigarette smoke, or cooking smells, get busy. “I've been in a showing where someone had just cooked breakfast and my people were so grossed out they wanted to leave,” Ferrell said. Covering smells up with strong candles is worse than the original smell, so do whatever it takes to get odors out, whether that's refraining from cooking while you're showing, emptying the trash and litter box daily, opening all the windows, replacing your HVAC filters and cleaning the ducts, or renting a heavy duty air filter.